Finally we get this game over to the West after all of these years of being teased. Well finally the first Yo-Kai Watch is here and only on Nintendo 3DS. You are a young boy who magically discovers a capsule machine in the middle of the forest. You insert a coin and behold! A Yo-Kai appears! He quickly befriends you and explains what Yo-kai are and how you are able to obtain and see different Yo-kai's. 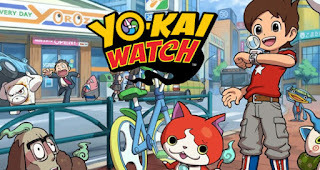 You are on a quest to save the human world from the Yo-kai world which you find out is being ruled by an evil Yo-kai and you are trying to stop them from entering the human world. 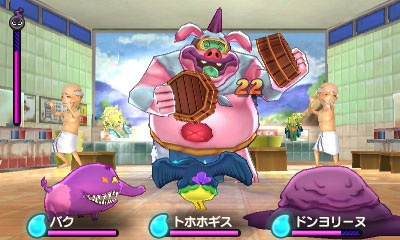 Yo-kai Watch is in kind of a way like Pokemon but very different from it. You do capture and tame wild monsters hiding out in the wild. You are only able to see these monsters with the power of the Yo-kai Watch which gets upgraded as you progress through the game. In order to see stronger Yo-kai you will have to keep upgrading your watch. 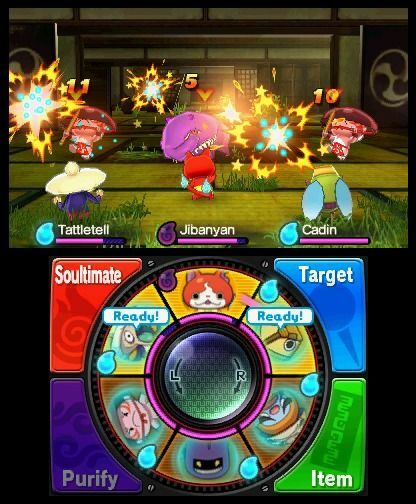 Yo-kai's get stronger as you battle with them and some even evolve into stronger Yo-kai's. Fairly early in the game you also discover you are able to fuse certain Yo-kai together to create new and more powerful Yo-kai's. The world which you explore is fairly large in size for a 3DS game. As you progress you unlock new areas to explore in this huge city. Each area also has their little hidden areas such as Alley ways, tunnels, and shortcuts. Everywhere you search you are always able to find Yo-kai. Yo-kai are based on their ranks, so the higher they rank, usually it means they are stronger. Each time your watch picks up a nearby Yo-kai the watch will actually tell you the rank of the nearby monster so you will know if you're up for a challenge or not. Overall the story of Yo-kai watch is pretty good with some moments of laughter and some moments of sadness. The animations are beautiful and full of life. Some clips are from the TV show as well. Sometimes I did feel that the story was kind of jumbled and sometimes you forget why you're doing certain things. Besides the main story there are several side quests and favors to do to earn some extra money and experience. Some even give you items to further power your Yo-kai. The combat is fairly weak in my opinion. It is very fun but half the time you're sitting there watching your Yo-kai attack since it is all automated. What really drove me mad sometimes is the fact you are not able to select which attacks your Yo-kai's use. The only way to "alter" that is to change their moods with items. Some will make them more aggressive and attack physically while some will mainly focus on healing. During combat you also have control of a wheel type system on your touch screen. This is the fun part of the combat ad you are able to rotate up to six Yo-kai to fight. You also use this to give your Yo-kai items, purify them or to use their specials which are for the most part really fun to do. To use their specials you will either be spinning the wheel rapidly, cracking the glass or tapping power orbs as quickly as possible. The only true annoyance I had with this game was Terror Time. Terror time has a random chance to trigger. It gives you a notification with your watch in the top right corner of the screen where you will see a count down from 3. In terror time you have to escape back into the waking world without getting caught by the huge Yo-kai trying to find you. There are special chests that you are able to get in Terror Time, some have powerful items. But as time carries on more monsters spawn and it becomes difficult to hide from them. If a Yo-kai see's you it yells and calls for the Yo-kai that is hunting you down. If you get caught you have to fight him which I recommend you never do. Overall Yo-kai watch was a very fun experience. Lots to do, lots of Yo-kai to obtain and a huge open world map to ride around in. I highly recommend this game for the Nintendo 3DS.